The American edition of Harper’s Bazaar is rich in fashion imagery, therefore we don’t blame it for emulating one of its most iconic covers from the archives. 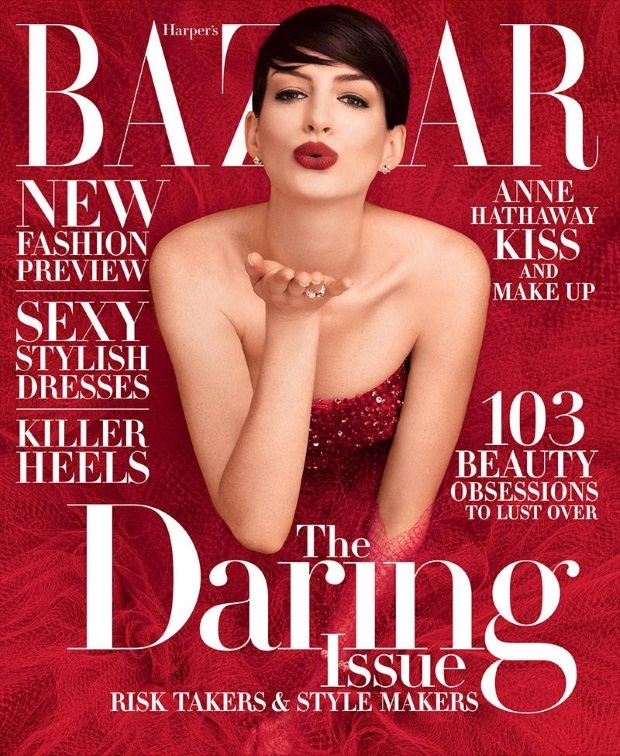 Anne Hathaway stars on the magazine’s November 2014 issue and the concept appears to have been copied from the January 1995 cover with Linda Evangelista. Photographed by Alexi Lubomirski, Anne wears a show-stopping red couture piece from Armani Privé, while blowing a kiss out to the reader. Our forum members feel as though the cover should have been left until December. “Wow, it looks so festive. Even more than Katy Perry‘s cover from October. I wonder how festive their December cover will be,” commented mikel. “Again with the color overload, I wouldn’t mind this for December, but it’s just so literal. Compare this with the covers earlier this year and see! Guess I’ll have to wait for the sub edition,” agreed Benn98. “These are gross, like rejected Estée Lauder ads from the early 90s,” disapproved jeremydante. “This is lovely, I love all the red and Anne looks great. Reminds me of that shot of Linda Evangelista in the yellow dress though,” shared LastNight. Are you a fan? See inside the thread for Anne’s cover story and share your own opinion here.